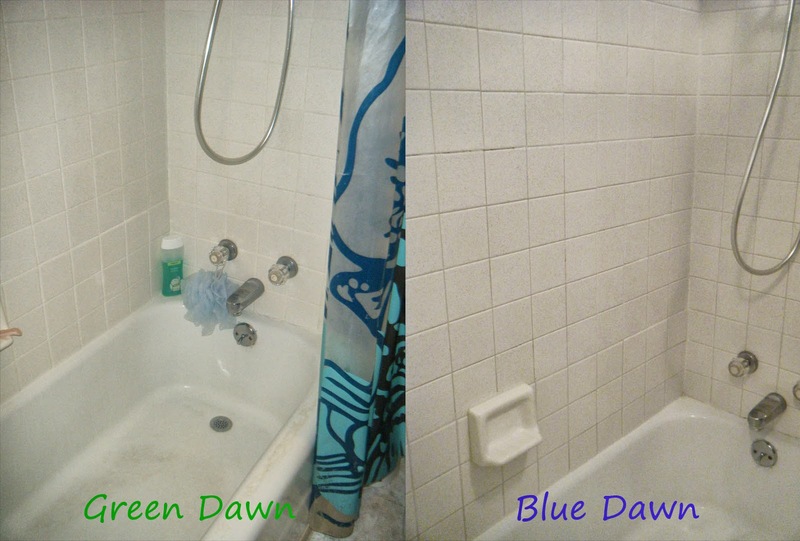 My sister-in-law swears by using blue Dawn and warm vinegar to clean your shower. Being that I love using cleaning products that aren't high in chemicals I decided to give this a try. However, I only had green Dawn. I decided to try it anyway and it didn't work that well. Not that I was surprised because I have always been skeptical about its cleaning ability. However, I kept hearing that it must be blue Dawn and that it will work. I know that vinegar can be used as a cleaning product, but blue Dawn? Does it have some mystical cleaning power that other colors/versions of Dawn do not? I have kept on wondering this since my disastrous shower cleaning attempt with green Dawn. So, I decided to give it another shot and the answer is yes! The image on the left is using green Dawn and the image on the right is using blue. It's hard to tell, but the blue Dawn/vinegar mixture worked so much better. I guess I have come across to the dark side now too and have found an extremely cheap shower cleaner! what? that's crazy. I agree wholeheartedly that Dawn reigns supreme over other dish soaps, but the color thing makes no sense. I generally use clear and free dawn with no issues. I left the green on longer than the blue and it didn't work nearly as well. Weird! Hahaha! Alan did say that it smelled like a chemical bomb exploded in my bathroom afterwards. He wouldn't let me clean the downstairs bathroom because he was going to be down there and had to smell it. That blue works and green doesn't? Or that mixing vinegar and Dawn works at all? I love that it actually does work because it's a heck of a lot cheaper than buying Seventh Generation! that the blue works and green doesn't! WOW, what a difference. I am going to try that!